PUBLIC RELATIONS – The proposed Red Knight takeover at United is an interesting story. United fans are hungry to depose the Glazer family and have organised a high profile ‘green and gold’ campaign to make their views known. As a United fan the idea of ensuring United are placed on a strong financial footing is appealing to me, as is the concept of the fans owning the club. However, from a PR perspective the communication to date puts forward an interesting public relations question. Is the proposed deal from Red Knights a tangible fan led operation, or does the Red Knight group mean another debt backed acquisition, similar to the last one? The following paragraph from The Times both worry and excite me. Surely a takeover of this nature means more debt and more fees paid out of the club to deal makers, or does it mean a Barcelona style fan owned scheme? From a PR perspective these two paragraphs show the importance of communications and PR. Both markets and fans like stability and clear and concise communications. Over the coming days and months the details of the Red Knights’ deal will come to the fore. However, in the mean time ambiguity will surround the story, while the fans will no doubt get be roused by the scent of revolution and thoughts of deposing the Glazers. It’s a brilliant story from both a footballing and PR perspective. 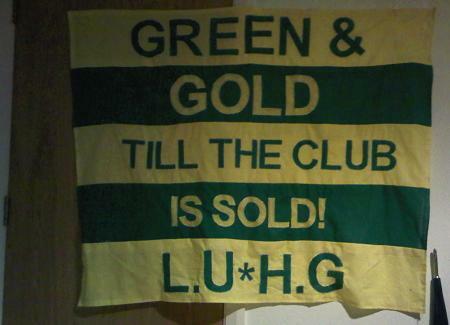 If you want to join the Green and Gold movement you can do here.